We’d love your help. Let us know what’s wrong with this preview of Spying on Whales by Nick Pyenson. Whales are among the largest, most intelligent, deepest diving species to have ever lived on our planet. They evolved from land-roaming, dog-like creatures into animals that move like fish, breathe like us, can grow to 300,000 pounds, live 200 years and roam entire ocean basins. Whales fill us with terror, awe, and affection--yet we know hardly anything about them, and they only enter our awareness when they die, struck by a ship or stranded in the surf. Why did it take whales over 50 million years to evolve to such big sizes, and how do they eat enough to stay that big? How did their ancestors return from land to the sea? Why do they beach themselves? What do their lives tell us about our oceans, and evolution as a whole? Importantly, in the sweepstakes of human-driven habitat and climate change, will whales survive? To ask other readers questions about Spying on Whales, please sign up. Nick why do you like discovering things about Whales? Actually, it's not 'out' yet....will be on June 16th....I certainly will TRY to find it in my local library.....if not there, there is always Interlibrary loan.. hopefully in my town.....they do have access to larger libraries therefore I am hopeful....OTHERWISE just might buy it from the bookstore...AND... if they don't have it IT CAN ALWAYS BE ORDERED. The book sounds so interesting...i.e., if you into Nature...?? This is the endeavor of Nick Pyenson, a paleontologist and curator at the Smithsonian Institute, who shares his passion for whales and the history their bones tell us. He himself cons Spying on Whales is a beautifully written introduction to the immersive world of whales. From their ancestry to their future, the beauty and evolution of these magnificent creatures as well as their adaptability, influence and importance to their and other ecosystems is explored in easy terms anyone can understand. Part I tells us about the PAST. A chronicle of whale history from mammals walking on land to their transition to aquatic animals. This is the part scientists rely mostly on fossil records. It therefore explains how paleontologists look for clues and what questions they have to ask themselves to uncover the details presented. This information borderlines with other sciences and tells us about whales in geological time. Pyenson specifically spends a greater part of detail on the discovery and his works at Cerro Ballena, the world’s richest fossil whale graveyard. Part II tells about the PRESENT. How did whales become the biggest creatures ever in the history of life? What are the challenges of sustaining such enormous sizes? Here is where we learn about biological processes of whales and Pyenson’s work at a whaling station. What are the challenges of studying organisms of such size? What are his newest discoveries? Part III explores the (uncertain) FUTURE of whales. It informs of population rates, climate change, new habitats, other species affected, changes in the oceans and new unusual whale sightings. I was really excited when I saw and read about this book. Whales are such majestic and mysterious creatures and I thought it would be a fascinating read. Unfortunately, no. Spying on Whales was actually quite dull and boring. How is that even possible for a book on WHALES ?? This book was all over the place rather than written in any type of linear fashion. It jumped from paleontology to whaling expeditions to stories about scientists to the evolution of whales to their anatomy and back and forth and around and around. Just when I started to get interested in something, the author would jump to another topic. Rather than answer questions, he simply framed more. I learned little about whales in this book, sadly. I realise that partly this is because there is much about whales that we humans still do not know; however, the blurb of the book was quite tantalizing, dangling the promise of answers, compelling me to read the book. OK, I went and read the synopsis again. Perhaps I should have read it better before; it says, "Nick Pyenson's research has given us the answers to some of our biggest questions about whales". So there it is: This book has some (very few) answers. Maybe I'm just greedy and expect too much, but when I read a science book, I want to actually learn something. •The record of time a whale has been recorded holding its breath is 137.5 minutes. That's over 2 hours' worth of oxygen sucked into its lungs! Nick Pyenson shares so many facts about whales...species that still swim in our oceans and ones that are long gone. He discusses the ancestors of I've always had a fascination with whales, dolphins and other mammals that live in the sea. I think maybe it's because they are so like us, and yet so different at the same time. When I saw this book written by a Smithsonian paleontologist, I knew I had to read all about the past, present and future of whales. I'm glad I did -- this book is fascinating! The author, a paleontologist, is Curator of Marine Mammal Fossils at the Smithsonian, a whale-family enthusiast, and a fine writer. I almost always prefer pop-science written by active scientists. Even better if they are doing field work, as that's what I did. You will learn a good deal abo First-rate popular-science book, the best I’ve read in 2018. Highly recommended, if you are interested in whales, marine biology and/or paleontology. If, like me, you like all three — don’t miss! 4.6667 stars. http://cerroballena.si.edu/content/3d Explore these 3D images of three of the best skeletons found at Cerro Ballena (Whale Hill), Chile. Very cool stuff. More at http://cerroballena.si.edu/images — which is only partly working, for me anyway. One of my jobs as a scientific journal editor was to commission review articles on topics of general interest from leading scientists in the field. A surprising number of reviews were unusable because the author decided to base the entire "review" around their own work. And this is a major problem with Pyenson's book. Most of the book is a somewhat rambling collection of his own experiences as a scientist without any real breadth. So there's lots about his own excavations of w 13th book for 2019. Did you know that whales used to walk on land before returning to the water? Oh the rabbit holes this book led me down….googled until my googler was sore. Easy to read (not dry at all) with fascinating tidbits. I love that the author makes you aware of what has been done by humans, along with what might happen due to humans (pros and cons), without being preachy or condescending. Favorite Quote: We sent whalesong into 4 stars - It was great. I loved it. Favorite Quote: We sent whalesong into interstellar space because the creatures that sing these songs are superlative beings that fill us with awe, terror, and affection. We have hunted them for thousands of years and scratched them into our mythologies and iconography. Their bones frame the archways of medieval castles. They’re so compelling that we imagine aliens might find them interesting — or perhaps understand their otherworldly, ethereal song. Pyenson is clearly obsessed with whales — with the idea of them, with studying them, with understanding them and sharing that understanding. In this volume, he does his best to share all those things: his enthusiasm for whales as much as his academic interest, his wonder at them as much as his understanding of them as part of their environment. He tours through whales of the past through their fossils (so if you’re a palaeontology nut, this one’s for you too! ), wha Reviewed for The Bibliophibian. I wanted very much to enjoy this book, but it was dry and poorly focused. The emphasis was on personal experiences and the paleontology/taxonomy, without strongly addressing the compelling questions in the jacket blurb. Although there are some illustrations, they are overly simplistic and seemed to be decorative and not informative. The notes section is good and provides interesting references and additional resources. This book was more than I imagined it would be. I've read plenty of books about whales (and loved pretty much all of them). But I've never read a book about whale fossils, which is largely what this book is about. Pyenson is a paleontologist and curator of fossil marine mammals for the Smithsonian. He's also a skilled and interesting storyteller, as evidenced by how little I wanted to put this book down once I started reading. There were a handful of words I had to look up (something I hope to b This book was more than I imagined it would be. I've read plenty of books about whales (and loved pretty much all of them). But I've never read a book about whale fossils, which is largely what this book is about. That scientists have been able to learn so much about the origins, past incarnations, and current machinations of whales from assorted bones and fossil fragments found all over the globe will never not be impressive. Perhaps the most memorable parts of this book for me are the chapters and pages centered on whaling, which are equal parts haunting and honest. I could write endless essays about how ridiculous, irresponsible, short-sighted, and self-serving it is that countries like Iceland, Norway, Japan are still whaling, but what's even more devastating is how many millions of whales were killed by men from all over the world in the 20th century alone: Three million whales gone. Species utterly decimated. Populations diminished to the brink of extinction, to the detriment of oceanic diversity and stability, and to the detriment of all of us. I liked this one. I found the search on whales fascinating, especially a whale that can live over 200 years. I grew up in Alaska and I learned about the wildlife in and around that great state. I've seen whales in the far distance, but never up close until two years ago when I went up for a visit and we went out on Resurrection Bay. It was quite amazing. They are so large, playful and an awesome sight. The author did his own narration and he did a great job. You could hear his passion for what h I liked this one. I found the search on whales fascinating, especially a whale that can live over 200 years. I grew up in Alaska and I learned about the wildlife in and around that great state. I've seen whales in the far distance, but never up close until two years ago when I went up for a visit and we went out on Resurrection Bay. It was quite amazing. They are so large, playful and an awesome sight. With a glut of science books focused on humans’ curiosity with the animal world, I am in awe. The ocean is just one big ball is amazingness that has yet to really be explored because it tests our limits, so it wasn’t hard to read this book when a Smithsonian scientist wanted to talk whales. And the title just was icing on the cake. Yes, that’s all humans are really doing- spying. Because we can’t do anything else at those depths and with our technology. But we sure as heck are leading them to ex With a glut of science books focused on humans’ curiosity with the animal world, I am in awe. The ocean is just one big ball is amazingness that has yet to really be explored because it tests our limits, so it wasn’t hard to read this book when a Smithsonian scientist wanted to talk whales. And the title just was icing on the cake. Yes, that’s all humans are really doing- spying. Because we can’t do anything else at those depths and with our technology. But we sure as heck are leading them to extinction and that pisses me off. Then you become mesmerized by factoids like whales are being clocked in at 200 years old based on eyeballs, ovary scars, and teeth. There was quite a bit about there history and specifically excavation of bones at a few particularly rich locations in the world and while he was fantastic at telling the story, it was less interesting than discussing the present that we’re living in for obvious reasons. He spoke to several of the species and to their awesome features. I could read on and on. When I finished I wanted to fall down the rabbit hole of watching YouTube videos of whales but surprisingly there are not many. A few clips for National Geographic, some amateur video from whales emerging from the water in front of a boat, but not much else to be awestruck by (though there are several LONG videos claiming to have on repeat whale sounds for mediation and sleeping) and that just adds to their mysteriousness. 2.5 stars. How can a book about whales be boring? Well, this guy manages it quite well. I feel like the book I listened to is not the book advertised in the blurb. There's way too much background about the author. I don't care about him. I just wanted to learn about whales. The subject matter jumps around a lot and I just found that my attention wandered all the time. This was a good solid book on both paleontology and the evolution of whales. Often dinosaurs steal the show as far as this subject goes, but we sometimes forget that there are other interesting stories out there. There are a lot of good interesting little tidbits about other animals that lived around whales that you could learn about as well. Maybe a 3.5, but this book teetered between more exciting descriptions of expeditions the author had been on to sections which were pretty dry and academic. If you are interested in whales, especially Orca, read Carl Safina's books. His intensity and beautiful writing made this book suffer by comparison IMHO. When I first started the book I saw the three main sections, past, present, and future and thought this would be organized as such, but it seemed to skip around. Given that Pyenson is a Pale Maybe a 3.5, but this book teetered between more exciting descriptions of expeditions the author had been on to sections which were pretty dry and academic. Won this book in a Goodreads giveaway from Viking books. This is a relatively quick, easy read packed with scientific data and anecdotes. Author is a paleontologist and rightfully includes his expertise to help explain the natural history of whales and highlight many of the questions still not 100% understood about these marine giants. I love that the author shows how a scientist works through a problem through what may be taught as the scientific method. I've seen that many people didn't care for this book as much as they expected, because it tends to wander off of the straight and narrow path of being all about whales, and I can agree with that point. The author does give us a look into the work he does, both in the Smithsonian and out in the field, his personal thoughts, the discoveries he has been part of, etc. Honestly...I loved that. His descriptions of the places and events that happened pulled me into that very moment. For example, I recall feeling excitement as he described one of the finds, and understanding his feelings of conflict over whaling. I guess you could say I enjoyed seeing the behind the scenes view of whale research too. But yes, you will still learn about the past, present, and probable future of whales in this book. I wasn't completely ignorant on the topic of whales before this, but I can certainly say I added a lot more information to the section of my brain dedicated to these beauties courtesy of this book. For instance, a right whale was found around the beginning of the 21st century with a nineteenth century harpoon head in it. That would have made this whale over 150 years old. Definitely worth the read (or listen). Fascinating, easy read about these majestic animals. I found the evolutionary history and the author’s guesses as to where the different species of whales may lead to be the most interesting aspects of the book. Worth the read. Fascinating, comprehensive & fun. The paleontology angle was new to me and added depth (pun intended ;-)) to the subject. The bit on dissecting whales at a whaling station in Iceland was especially fascinating! DNF. Very interesting, but I need to be in a different state of mind to read it. Hopefully I can finish it in the future. This book was very dry in places and I found the writing a bit scattered going from one thing to another. I wish it had been a little more linear. I finished reading “Spying on Whales” by Nick Pyeson. I found it to be an informative book on everything whales. I learned quite a few new things about whales. Beautiful animals! This book is SO good! I have always been interested in whales and paleontologist Nick Pyenson definitely has a deep and abiding love for them that comes through in this book. He divides the book into three sections—past, present, and future—and writes eloquently about whales. Ancient whales that were fossilized, whales whose populations were decimated by whaling, and what the future may bring for whales in a world populated by more and more humans. I think the most fascinating thing I read was ab This book is SO good! I have always been interested in whales and paleontologist Nick Pyenson definitely has a deep and abiding love for them that comes through in this book. He divides the book into three sections—past, present, and future—and writes eloquently about whales. Ancient whales that were fossilized, whales whose populations were decimated by whaling, and what the future may bring for whales in a world populated by more and more humans. I think the most fascinating thing I read was about the lifespan of bowhead whales. Pyenson demonstrates through scientific investigation that these massive creatures can live for over 200 years! They live in the Arctic and were hunted back when whaling was still legal (or rather, practiced a lot more than it is now). Since i was little I always was so intrigued about whales. This book lived up to what I was expecting and I learned quite a fee new things. Writing about science in a manner that is entertaining and accessible while also conveying the desired information with clarity and concision – not an easy task by any means. Finding the proper balance of wonky jargon and narrative engagement requires a backwards-and-forwards depth of knowledge about the subject matter AND significant storytelling acumen. It’s a shot at harmony while dodging discord. In short, there’s a real art to science writing. 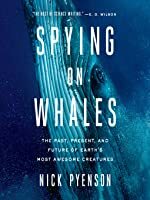 Nick Pyenson’s new book “Spying on Whales: The Past, Present, and Future of Earth’s Most Awesome Creatures” is a prime example of getting it right. Pyenson is unabashedly wonky for long stretches (though he does come by it honestly - he’s Curator of Fossil Marine Mammals at the Smithsonian and a noted paleobiologist), but he also allows his personal passion for the work shine through. True passion is infectious, and that’s what he brings to the table – the reader can’t help but be drawn along. The book’s format is precisely what its subtitle tells you it is. 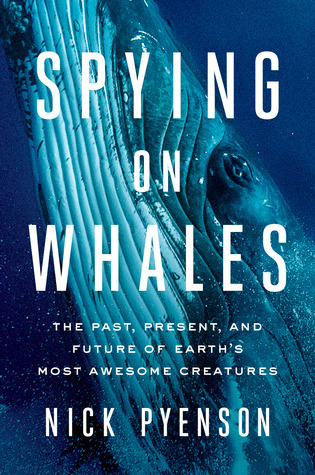 “Spying on Whales” comes in three parts, each section an exploration of the past, present or future of the largest creatures on Earth. In Part I, we get a good look at Pyenson’s work with fossils. We pay a visit to an unexpected treasure trove of ancient whale bones discovered in Chile and watch as he’s forced to rely on unconventional solutions to ensure the future educational possibilities of the site. We follow him deep into the nooks and crannies of the Smithsonian, learning about the multitude of whale artifacts therein. We even get a couple of deep dives (pun intended) into how whales have come to be and how they’ve impacted the ecosystems in which they exist over the millennia. With Part II, Pyenson gives us a closer examination of whales as they are today. These whales are true giants of the seas; the biggest of them are arguably the largest creatures to ever exist on this planet. Seriously – the largest recorded blue whale is basically the same size as the largest of the dinosaurs. And so many others are also gigantic, so big as to beg questions with regards to the logistics of their existence. We also spend time with Pyenson at an Icelandic whaling operation where he and his team are able to explore whale biology in ways that hadn’t been done in years if at all. As for Part III, we get a glimpse at some of Pyerson’s thoughts about the future of whales. With the changing nature of the climate, there are some ecological shifts that impact whale life (some positively, others negatively). The population devastation wrought by the relentless overkill of the whaling industry’s peak has some major consequences for species viability going forward as well. The seas were once teeming with whales, but mankind’s interference – filling the seas with noise and trash and carbon dioxide – may ensure that such a day never returns. Full disclosure: were it not for my job, I might well never have picked up “Spying on Whales” in the first place. While I have my affection for science-oriented nonfiction, I can’t say that I’d ever given whales much thought. And there are plenty of other new books out there to review. Yet this is the one I started to read. And I’m truly glad I did. What “Spying on Whales” does so beautifully is convey the seemingly boundless passion of a scientist in a way that is true to his work without sacrificing accessibility. Despite the fact that Pyenson does get a little wonky at times, the book continues to engage. The specifics and minutiae being shared are a delight, but even if they’re a bit too much, their presence never impacts a more general understanding. Anyone who has spent even a little time thinking about it is aware that whales are fascinating creatures, but what books like this one do is shine a light on that fascination. Pyenson loves them and loves learning about them … and wants the reader to love it too. Academic joy is weird and niche, but it’s also pure and entertaining as heck.